Crolla’s is a well known and established gelato company out of Scotland that has been in the business of serving desserts for over 120 years. The rich history behind the brand started in 1895 when a young Serafino Crolla exchanged the warm sunshine of Italy for the less predictable climates of Scotland, setting up his first shop in Queen Mary Street, Glasgow. His son, Giuseppe, opened a second shop in Clydebank, and after the first World War he returned to Scotland and opened Premier Cafe in Main Street, Bridgeton. This was followed by expansion into the two adjoining premises. Peter Crolla (the fourth generation of the company) has set out to franchise and expand the business. 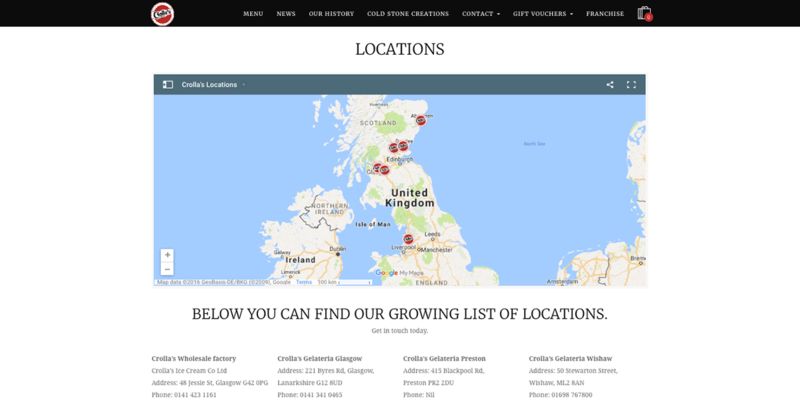 Along with David Moffatt of Iguana Eyes we have worked together to build the new Crolla’s website. The main objective was to transform the website into a functional, aesthetically pleasing place for people to dive into the Crolla’s brand. With plans to franchise and two new locations opening soon; the website covers the historic background while giving potential franchisees a good taste of what the Crolla’s brand is all about. 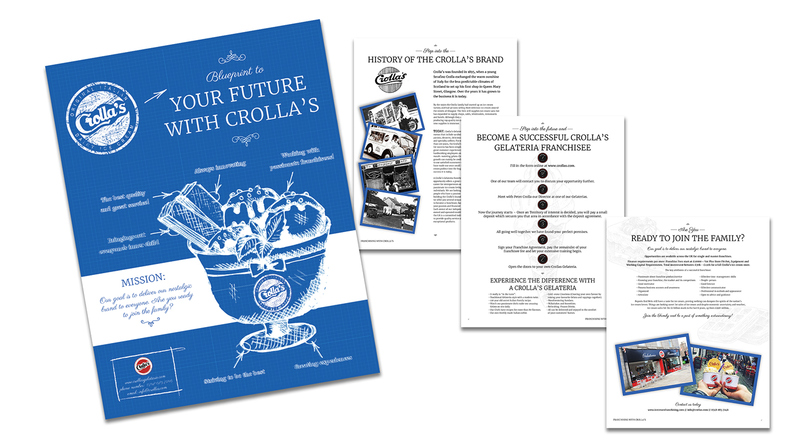 Along with the main franchise objective, we still had to develop pages suitable for customers looking to find the Crolla’s menu and locations. Given the requirements the best solution was to base the theme off of a tempalated wordpress site. Which I found did not limit my creative abilities in the least as I was able to find optional themes that worked perfectly with their goal to focus on franchise opportunities. 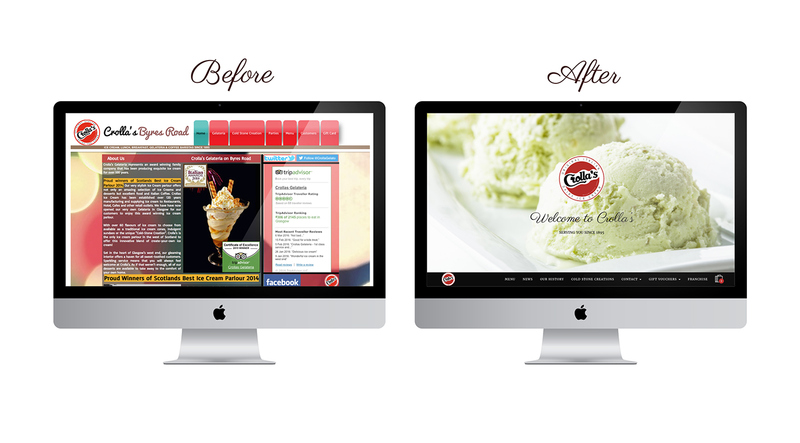 The theme had to include what was already on the previous site including a menu page, a Cold Stone page (which was one of their unique selling features) gift vouchers, an about page and a contact page. 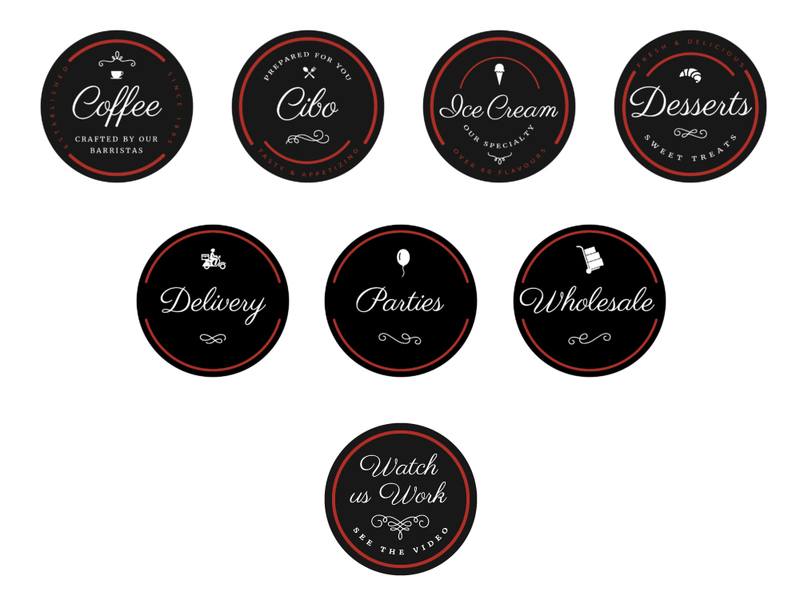 They also liked a set of icon circles that I produced to reflect the logo and tied into the look of a few of their existing graphics. The project was organized and planned to ensure the stages were met in a timely manner and all phases were carried out accordingly. During each phase we would meet over Skype to ensure all expectations were being met and any changes that were needed would be resolved. I had to ensure I kept in line with their existing brand while making a consistent feel throughout the site. One of the main concerns was to maintain the high rankings on search engines, as previous to the revamp the rankings were quite high. I payed high attention to the optimization of all the elements being added to the site as well as the text written. All back-end content was highly reviewed to ensure the site would run quickly and maintain the SEO high ranking as best as possible. On the locations page I was able to bring in a custom Google map that specified the various Crolla’s locations. If a specific location is clicked on the map it gives the option to view in Google maps. This further gives the option for directions from their current location (if these specific settings are set on their phone). With great passion behind their brand the pressure was high to deliver a great end product, and I was more than happy to say that the project ran quite smoothly and both David and Peter were both pleased with the outcome. Since the project launch they have been busy with opening two new Crolla’s locations and working two more opening soon in the near future. This has also brought in additional projects including the franchise brochure shown below and help with their store signage for their new locations. I look forward to seeing new franchise locations unfold. Crolla’s Gelateria represents an award winning family company while providing more than just ice cream including a full menu of delicious food, beverages and a side of nostalgia. Crolla’s is firmly committed as ever to serving top quality ice cream, while ensuring the best experience possible when you walk into one of their Gelateria’s. Please visit www.Collasgelateria.com for the Crolla’s experience.